With the conclusion of the Battlefield: Barrens event, realm coalescing has been re-enabled for the Durotar area. Glyph of Regenerative Magic should no longer improperly increase the cooldown on Anti-Magic Shell when a small amount of absorption remaining as it expires. Nature's Grasp triggering Entangling Roots should no longer be incorrectly using up Nature's Swiftness. Deterrence should now correctly have a 5-second cooldown after using a charge for Hunters with the Crouching Tiger, Hidden Chimera talent. Xuen summoned by Invoke Xuen, the White Tiger should now be able to use Crackling Tiger Lightning against Aberration type creatures. Killing Spree's range is no longer being incorrectly modified by Blade Flurry. Cursed Hozen Swabby now has a 2-second cooldown on their Rusty Shank ability. Players on Raid Finder difficulty with the Despair aura should no longer remain in the wrong phase when the fight ends. Look Within should now correctly favor selecting characters with higher levels of corruption for trials during the Norushen encounter on Raid Finder difficulty. 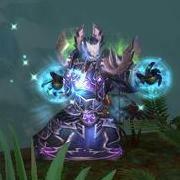 Alter Time no longer teleports players that have been banished on Heroic difficulty. Altered the visual effects of Bursting Pride, Swelling Pride, Aura of Pride, and Unstable Corruption to improve their clarity and visibility. Portals to Orgrimmar should now spawn properly after defeating the Sha of Pride and soft resetting the instance. Resetting the Galakras encounter should no longer cause doors to the towers to remain closed. Siegecrafter Blackfuse will no longer Overcharge more than one cluster of Crawler Mines per wave on Heroic difficulty. Removing the Touch of Y'Shaarj or Empowered Touch of Y'Shaarj debuff now also removes Weakened Blows, Mortal Wounds, and Master Poisoner effects from the player. Garrosh no longer has a chance to critically hit when under the effects of Leader of the Pack or other similar buffs from players that have been mind controlled by Touch of Y'Shaarj. The Crowd Chose You should now be correctly applied to players that are under the effects of Cyclone. NPC party members should now be better at moving out of the fire, and use their area-of-effect attacks and swap targets correctly. Large Illusionary Flamecallers no longer cast Pyroblast against targets that have been recently hit by a Fireball. Toy Windmill should now only summon 1 Windmill Lance. Fixed quest tracking issues that affected some of the quests on the Timeless Isle. [Requires realm restarts] Keg-Shaped Treasure Chest should now be awarding level-90 items.